The slimmest, strongest and most thermally efficient, full aluminium Roof Lantern system on the market. No clunky bars or supports cluttering the ridge. No thick, chunky profiles dominating the glazing. Atlas' unique design is pure engineering magic. Super strong, light, 40mm aluminium box rafters create slim elegant roof profiles with excellent thermal performance. Compared to conventional roofs sold by competitors, Atlas slashes the visible width and sightlines of rafters by 30% and the main feature ridge by 70%. This unique design creates a feeling of MORE SKY - LESS ROOF giving you visible elegance to your roof design and overall appearance. The slimline thermally broken aluminium rafter sections have a sleek appearance that brings a stylish ambience and is pleasing to the eye, while maximising the use of light and space within your home. Using the benefits of slimline technology Atlas have combined good looks, outstanding strength and intelligent detailing, to create one of the finest looking products available for Roof Lantern and Orangery installations. The versatility of the aluminium box section rafters and creative design solutions have removed the requirements for outdated bulky hood covers on lantern roofs and edwardians. Most competitors insist on a rod tie bar at eaves beam level whereas Atlas have a choice of hidden, rafter or rod tie bar supports which provides the ultimate luxury and flexibility for you to create the roof and environment you want. Extra strong rafters mean the tie bars can be set higher, guaranteeing excellent headroom and no intrusion into the living area. Even in large buildings, the roof structure remains remarkably minimal, creating a sense of clear, free space under the eaves. Increased roof strength means the design aesthetics and clear sightlines achievable using the slim Atlas profiles remain unmatched by any other manufacturer, creating a roof that can suit any dwelling and project. A U-Value (W/m²K) is simply a measure of heat loss from a building structure - for instance a roof, or a window and frame. A high U-Value means thermal insulation is poor whilst a low U-Value indicates a good thermal insulation. As a glazed roof is made up of both glass and rafters, you want the U-Value to be low from both. High performance glass is usually rated at 1.1 or 1.2 U-Value, but the value of roof rafters vary considerably. The Atlas rafter has a U-Value of 1.5 W/m²K, which is twice as thermally efficient as its nearest competitor. When using double glazed low e glass (U-Value 1.1 W/m²K) the overall Atlas roof has a U-Value of 1.2 W/m²K. 44mm Triple Glazing is also available as an optional extra, making the Atlas Roof Lantern the UK's most thermally efficient roof system with a U-Value as low as 0.6 W/m²K. Each Roof Lantern comes as standard with 24mm Pilkington Activ Toughened, Self Cleaning Glass filled with Argon Gas and with Warm Edge Spacer Bars. There is a choice of colours including Activ Blue Self Cleaning and Activ Neutral Self Cleaning. Independent tests carried out by the British Board of Agreement (BBA), Queens University and Independent structural engineers all confirm the Atlas roof is the strongest glazed roofing available in the UK domestic conservatory market and conforms to Part L of Building Regulations. The roofs have been designed to withstand 33% greater live loads (wind/snow) than other roof manufacturers. Delivery throughout the UK is free of charge. Please contact our sales office on Telephone 01623 624500 for further support and advice. Please Note: All images displayed are for illustrative purposes only. Please contact our sales office if you require a specific design. For Roof Lanterns, Atlas offer a 10 year manufacturers guarantee as standard. For our Roof Lantern brochure, click here. For Atlas technical data, click here. 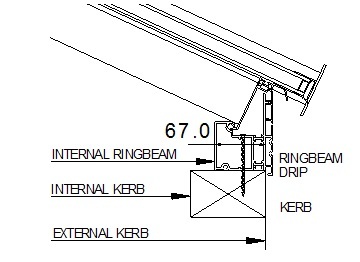 For Roof Lantern Installation Manual. click here.